It is early in the morning of Thursday, 28 January, 1796. In their cell at Newgate Prison, three men are woken by the dull clanking of a bell, being rung in a slow, sombre manner. This is the execution bell, brought out from the church of St Sepulchre without Newgate, just opposite the prison, and rung by the curate to denote an impending execution. It is the sound that all condemned men dread; the sound that means they only have a few hours left to live. Today, the bell rings for a Cherokee Indian named Francis Cole, Irishman George Colley and Michael Blanche, who is from Spain. They are sailors, used to exciting journeys on the ocean. Now they get up, ready for their last journey. Now we look back, to the previous autumn. Part of the crew of the merchant ship American Eagle, sailing in the English channel, the three men had formed a gang together with three American sailors – Samuel Dearborn, Archibald Hart and John Cassado. They had devised a plan to gain control of both the ship and its valuable cargo, and it involved the death of their master, William Little. 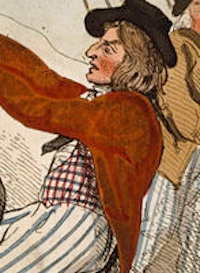 The men were apprehended on the Isle of Wight, attempting to sell on some of the ship’s goods. But once in custody, the Americans turned King’s evidence, and incriminated the rest of what was described as a ‘motley set of desperadoes’. The first two men, Cole and Colley, were tried at the Admiralty Sessions – the court session that heard cases of piracy – on 24 November 1795. The trial took place at the Old Bailey. Two other crew members, Michael Blanche and Emanuel Batha, both from Spain, should have also been tried at this point, but their trial was postponed in order to ensure that the jury included other ‘foreigners’ like themselves. They also required translators, as they were unable to speak English. When they were finally tried, only Michael was found guilty of murder; Emanuel Batha was acquitted after witnesses spoke of him being ‘an angel’. Now forward again to 28 January. 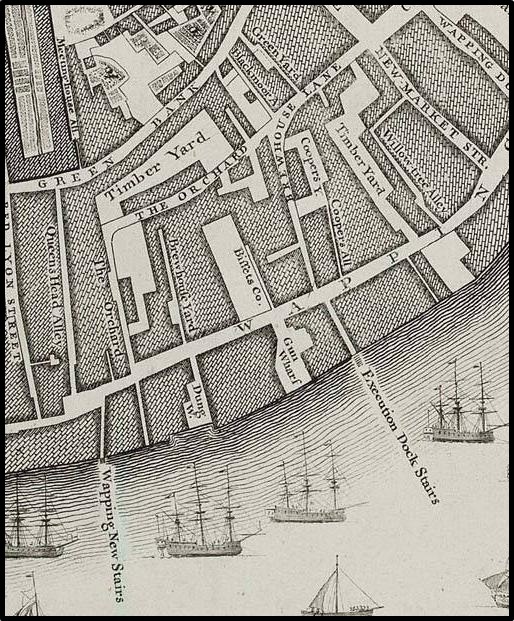 Once up and dressed, the condemned men are placed on a cart, which is then wheeled – accompanied by City officers – through the streets of London; up Newgate towards Cheapside and then on to Wapping. Here, on the Thames foreshore, is the infamous Execution Dock. It is where pirates and mutineers are hanged, from a noose that swings over the river. It is raining on this Thursday morning, and cold. Yet around the dock are gathered thousands of people. These are not just those looking for a bit of grim amusement; many are seamen, or sailors, themselves, and they are a mix of those who knew or supported the murdered man, and those who have known and worked with the convicts. They wait. There is a bit of jostling, some shouting. Prayers are said out loud; Francis, George and Michael listen intently, although some say they look obstinate and sullen. Sullenness may, of course, be confused with fear. At 11 o’clock, the men are, to use the contemporary expression, ‘turned off’. They swing from the nooses, doing the marshal’s dance, as the involuntary thrashing of limbs that occurs during hangings is known. They swing, their tongues protruding and their eyes bulging – staring but unseeing. They are dead, but what they dreaded most is still to come. They will not be left to swing as a warning to others, but instead will be cut down and transported to the Surgeon’s Hall to be dissected and anatomised; exposed to the public who watch from the gallery there. But for a few minutes more, they continue to swing, over the grey waters of a still and quiet river. Case taken from The Times, Friday 29 January 1796; The New Annual Register of 1796 and the Newgate Calendar. I’d forgotten I had done this, but I did a quick list for Buzzfeed (on its community section). So to see my list of 15 punishments we used to think were acceptable, click here. Not an in-depth look at crime and punishment, but an, um, lighter-hearted look at execution and such like.